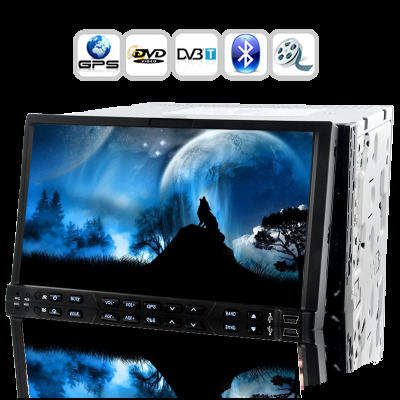 Successfully Added Car DVD "Road Wolf" - Detachable Panel, GPS, MPEG2-4 DVB-T (2DIN) to your Shopping Cart. First of all, the Road Wolf offers you all the in-car entertainment options you could ever imagine. It comes with a high definition 800 by 480 pixel resolution touchscreen, and brings to you a region free DVD player to enjoy your collection of favorite movies. With AM/FM radio, an awesome media player that effortlessly plays all of internet’s popular audio and video file formats, you can be sure to be entertained on your road trips. If that weren't enough the Road Wolf lets you watch your favorite TV programs through DVB-T, and allows connection of your iPod or MP4 player for even more choice. Second of all, with GPS navigation the Road Wolf lets you get to your desired destination on time and stress free. Compatible with today’s popular GPS software, the Road Wolf lets you get access to powerful features like: night vision, lane assist, voice guidance, 3-D views, intelligent route planning, and points of interest (POI). The Road Wolf also comes with Bluetooth for safer driving while you are receiving and making phone calls. If you want the most powerful, and performance driven all-in-one car DVD on the market today, all at a factory direct China wholesale price then order your Road Wolf 7 Inch Car DVD with GPS and DVB-T today. It’s in stock for immediate shipment now. Brought to you by the online leader in wholesale car DVDs, Chinavasion. Special GPS Note: This model is compatible with most brands of GPS software - however hardware specific software such as Garmin may not run on this unit. As the wholesaler, Chinavasion provides the GPS-enabled hardware only, not the software. Chinavasion provides no warranty or customer support regarding GPS software. Chinavasion cannot provide downloads / links / advice regarding GPS software. Any software installation you undertake should be performed or supervised by a professional. The installation of this Car DVD Player should only be performed or supervised by a professional. Installata da 2 settimane, prodotto ottimo. La radio si sente benissimo, ricezione GPS ottima e il bluetooth funziona col mio nokia dell'ante guerra. Pro: prezzo, frontalino estraibile, qualità radio ottima, ricezione GPS ottima. Contro: DVB-T ricezione a scatti (ma inceramente è il minore dei mali), grafica scarsa e non personalizzabile.